Gutters are a necessary part of maintaining your home, especially if your home is surrounded by trees. 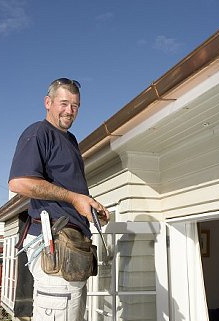 Unfortunately, gutter cleaning often takes a backseat to more pressing home repairs. But clogged gutters can cause rainwater to overflow, seeping into your home's woodwork and foundation and causing costly damage. Prevent drywall repairs, fix roof leaks or repair water damage to soffit and fascia with expert gutter cleaning. Gutter cleaning removes the leaves, nuts and twigs that prevent water from flowing away from your home. A regularly scheduled gutter cleaning by our professional, reliable staff extends the life of your roof and protects your home's values. We ensure that all leaves and debris are removed from gutters and downspouts, then check each downspout to ensure it's flowing. Referrals Roofing can also arrange to have quality Leaf Relief gutter protection installed on your existing gutters so you never need to have your gutters cleaned out ever again. To schedule your gutter service, call us today for an appointment!